A dense granular suspension dripping on an imbibing surface is observed to give rise to slender mechanically stable structures that we call granular towers. 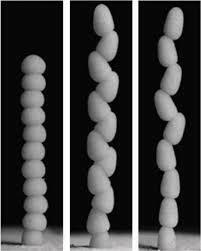 Successive drops of grain-liquid mixtures are shown to solidify rapidly upon contact with a liquid absorbing substrate. A balance of excess liquid flux and drainage rate is found to capture the typical growth and height of the towers. The tower width is captured by the Weber number, which gives the relative importance of inertia and capillary forces. Various symmetric, smooth, corrugated, zigzag, and chiral structures are observed by varying the impact velocity and the flux rate from droplet to jetting regime. Publié le 2 septembre 2016 par jchopin. Cet article a été publié dans Wet Granular Materials. Enregistrez le permalien.